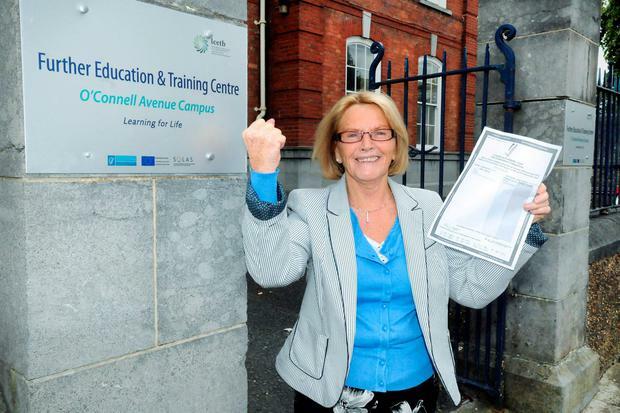 A 71-year-old Irish granny who is celebrating her Junior Certificate results has revealed that she was unable to even pen a letter three years ago before returning to education. Limerick woman Pamela Noonan (71) left school aged 11 and said she is “thrilled to pieces” with the results of the exams she took with thousands of students throughout the country last June. “When I left school I was only 11. I was taught by nuns and they didn’t care whether you learned or not. I just went out to work. “When I was young I scrubbed floors, I did house work, I did waitressing. “I decided then I’d learn from my children as they were growing up. “I wasn’t able to write a letter when I went into school three years ago,” said Pam speaking to The Anton Savage Show on Today FM. The granny of 14 from Limerick’s O’Malley Park made the decision to return to education in 2012 almost six decades after she left school to work. “My family life changed and my children grew up. I was left on my own,” said Pam. “I could have stayed at home and done nothing. But a lot of people go bad in the head from that. “So the first thing I did was go in and do a first year computer class. I never used a computer in my life. “I went up then to Further Education and Training Centre on O’Connell Avenue. They gave me a test and told me I was in. I said I’d love to do my Junior cert. I’ll never pass but at least ill try,” she said. The clever granny revealed that if she hadn’t left school so young she would definitely be ruling the country better than Irish politicians. “I’m going back now this year. I’m doing Level 3 in Maths, Communications Level 4, I’m doing a Higher level in computers. I’m going to do anything I can. “I’d be in there in the Dail doing a lot better than they’re doing now if I hadn’t left school. “My advice to anyone of the older generation is to get off your chairs and do something with your life if you have your health,” she said.